Title: HEY! Who let the sun go down?! Description: I'm sorry, I know its really dark, but its a Executive MAC! :) I do like the way my flash reflected off the logos and striping! Description: BNSF 9570 and a KCS GE lead an eastbound coal train across Harrison road on the CN. 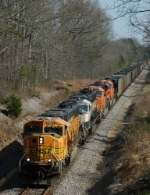 Description: Second unit on a coal train. Title: An empty coal train heads back to the Power River basin. Description: Finally a train shows up. 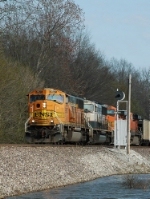 Title: BNSF 9202 Waits for a Meet. Description: Nb sitting at Mp 51 on the k line due to a Nb infront of this train waiting for a Sb to take the siding at old Monroe Mo.